LAUNCHING IN THE UK, Little Us is a brand new range of enchanting dolls for pre-school girls, each one with her own unique personality. These adorable soft dolls will soon become the must have under arm toy with girls choosing the doll that is ‘most like me’. Let your child begin the delightful Little Us story by identifying with one the girls – maybe it will be Chloe who likes everything pink, or Amelia who loves animals and reading, or perhaps it will be Ruby who’s just a little bit cheeky, or finally Millie, the tomboy of the group! Measuring approximately 12” high and made from the softest plush material, the dolls are so huggable they are perfect for young children as their first doll. 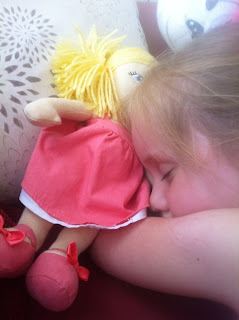 The dolls are ideal as a snug companion for play or sleep time and will encourage creative imaginative role play. Isla was sent a Little Us doll to give her opinion on it. I chose Chloe for her as Isla is very much into pink like a lot of girls her age. 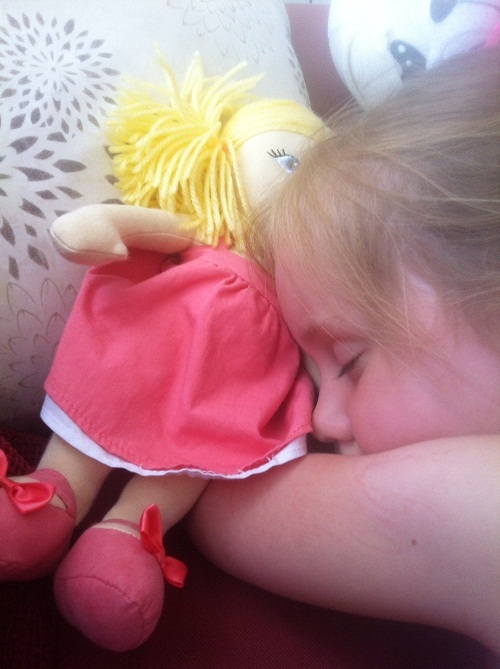 It's a really well made doll and perfect size for carrying around (my children both carry a toy ALL the time) and as soon as she got Chloe she was fastened in her toy buggy and was pushed around the house. Chloe has become a regular part of Isla's toy entourage now and has been elevated to sleeping companion. I asked her why she liked Chloe and she said "because she wears pink! ", with a tone of disdain, it's obvious Mum! I'm giving you a chance to win a Little Us Doll. All you have to do is follow the instructions on the Rafflecopter widget below. Good Luck! Read the Little Us stories and follow their adventures on their Facebook page www.facebook.com/LittleUsdollsDolls will be available to purchase from Harrods, Hamleys, Asda.com and Debenhams.com RRP £9.99. It only dawned on me yesterday that Valentina doesn't have any dolls! I'm now thinking what should I get, what should it look like, these are cute and cuddly I think she will like one. Chloe because she looks cute and a bit like my daughter lol! A Day Out with Thomas - Brilliant Family Fun! Big Birthday Weekend with Bezerkaz Circus!